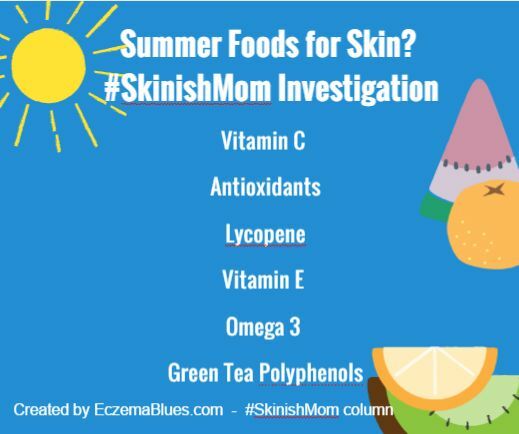 There are quite a few articles out there on what summer foods you can eat in order for glowing skin and #SkinishMom decides to investigate! You can never take for granted that if a food is recommended on numerous health/ beauty websites, it means that it is the summer (super) food to eat for your skin – sometimes it’s just one website copying another. So #SkinishMom compiles the common summer foods and look at what they are recommended for (vitamins, antioxidants) and research Pubmed to see if there is a scientific basis for such recommendations. This has been covered in this #SkinishMom column where it’s concluded (based on general dermatologists’ views online and research (or rather, lack of, since no one can earn money from researching water!) that being dehydrated is bad for the skin but excess water does not benefit the skin. Foods to eat for water during summer is watermelon, cucumber, celery, cantaloupe, tomatoes and strawberries. Summer fruits loaded with vitamin C are citrus fruits, oranges, grapefruits, lemons, limes and watermelon. Our skin, being the largest surface of our body, is subject to oxidative stress – from the sun, air pollutants, stress, alcohol and the foods we eat. Free radicals are formed during our body’s natural metabolism and oxidative stress but our skin have antioxidants to balance the free radicals. Intake of antioxidants have been studied to prevent carcinogenesis (formation of cancer cells) and protect cells from oxidative damage (e.g. limit the effects of sunburn). One study showed that sunburn to cells was decreased by antioxidant treatment via (i) protection from free radical and (ii) increasing epidermal thickness. Foods with antioxidants that are popular during summer are blackberries, blueberries, raspberries and strawberries. Drink up green tea too! This compound is studied to for collagen production and quite extensively known for its anti-cancer properties for melanoma (along with proanthocyanidins in grape seeds). Together with soy isoflavones, vitamin C, vitamin E, fish oil, lycopene has been studied to induce an improvement in the depth of facial wrinkles after long-term use. Foods rich in lycopene are guava, water melon, papaya, grapefruit and cooked tomatoes. Retinoic acid is essential for skin and bone growth and in the studies, mostly linked with cell development and use in cancer treatment. Be careful about taking too much neonatal vitamin A supplement as it has been studied to be linked to atopy and wheezing in children. Foods rich in vitamin A are carrots, sweet potatoes and pumpkins (but these are considered fall vegetables). The case for beta-carotene for skin isn’t so clear in studies though. Vitamin E protects skin membrane and guard against UV damage as it has UV absorptive properties. Avocado, broccoli and tomatoes are foods rich in vitamin E.
Essential fatty acids are essential from the time of our development in our mother’s womb! It’s critical for brain development (our brains are actually quite full of fats!) and for our skin, omega 3 is able to regulate oil production, have antimicrobial and anti-inflammatory properties. Omega 3 is also studied to maintain our skin (stratum corneum permeability) barrier, inhibit pro inflammatory compounds and elevate our sunburn threshold and promote wound healing. Experiment different recipes using avocado, chia seeds and salmon! Geen tea polyphenols (GTP) inhibits chemical carcinogen, induced by UV radiation. Green tea being calorie-free is a healthy drink to acquire a taste for. So this summer, drink enough water and eat some of these summer foods to help protect your skin – sun protection is still a must though!